Suddenly with all the bells and whistles, I'm becoming more cognizant about my health. Last night, I was introduced to the 80/20 rule and decided to look into it. Apparently nutritional and healthy lifestyle habits have a far greater impact on your body composition and physique goals than any other physique component. "Step back from the fitness industry, pop culture, or scientific debates and think about it logically for just a second. Lets say you perform 4 weight training sessions and 5 cardio sessions a week – a typical fitness protocol. That’s a total of 9 training sessions per week. That’s 9 chances to make a difference and change your body in a positive way. Now, lets also say you eat 3 square meals a day. Better yet, as a fitness athlete you know about the advantages of meal spacing and eat 5 meals/snacks a day. That’s 21-35 opportunities a week to directly impact your muscle building and fat burning goals. A common question in the fitness industry is, “what percentage of my physique enhancement goals will be a result of exercise, and what percentage will be a result of my diet?” Common answers are something like, “Well, they are both important. You can’t really assign percentages” or “training is 100%, diet is 100%”. But that doesn’t really give novice trainees an accurate depiction of the bigger picture. And in the big picture, diet will always have a bigger impact than training. In our above example of 9 training sessions and 35 meals/snacks geared toward body composition improvement a week, that works out to about 20% accounted to physical activity and 80% accounted to diet. I’d say that’s a pretty accurate assessment of the physique enhancement process. If you want to look good, 80% of your results are determined by the food that you eat." Earlier this week, after a bout on the scale, revealed that I have gained weight since Trinidad carnival. Weight I had lost even after delivering my son in December. So panicking due to a less than 6 week countdown to St.Lucia carnival, a Dr. Oz show titled "7 Day Crash Diet" got my attention, explaining how best to distribute that 80% on the right foods to eat. According to Dr. Oz, Dr. Joel Fuhrman has the best weight loss plan he has ever seen that is evidenced by a growing number of women that have lost significant amounts of fat - and kept it off. One of the main problems about weight loss and diets that special guest Dr. Joel Fuhrman points out is that dieters diet themselves into gaining weight by starving themselves to failure. The secret to his diet plan? 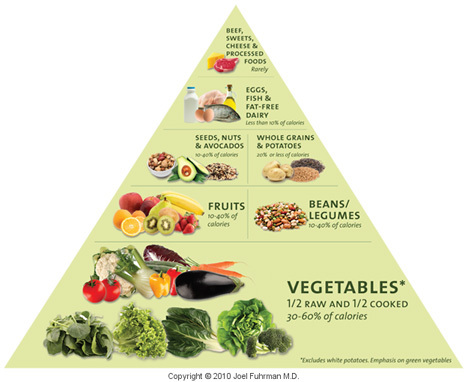 Eat as much nutrient-rich foods as you want while maintaining Dr. Furhman’s 90/10 Rule every day. The 90/10 Rule is simple and effective - consume 90% nutrient-dense foods such as vegetables, nuts, seeds, beans, whole grains and fruits everyday with each meal, leaving healthy oils, meat and dairy for the remaining 10%. He explains that why it works is that not only does it lower your caloric intake, but it substantially raises the amount of vitamins, minerals, phytochemicals and antioxidants that act as metabolism boosters and fat busters. The other added benefit is that you can eat as much as you want and never feel hungry while at the same time getting your body purged of toxins. That and seeing yourself lose significant weight in just 7 days will encourage you to continue to pursue a healthier lifestyle once you see that this diet plan works. To help dieters achieve success in losing that first 10 pounds in 7 days, Dr. Fuhrman advises viewers to adopt his three-step strategy summarized as follows. ... (and all this can be done, without even the need for exercise). The belief is get your eating habits cleaned up and then consider exercise. Forget about what you’ve learned before about starting the day with a protein-heavy breakfast to get your body going and sustained. Instead, incorporate 90% of your breakfast with nutrient dense foods like fruit, nuts and whole grain. No need for dairy for its calcium when an orange and other calcium-rich foods can take its place and result in less fat in your diet. Oatmeal loaded with a mixture of fruits such as blueberries, bananas, strawberries will not weigh you down with digestion like an egg will; but rather, will give you the quick energy you need to get started. For lunch, you should get into the habit of replacing meat with protein-filled beans that will not only make you feel fuller, but will also kick-start your metabolism. Beans not only provide non-digestible, resistant starch that lowers the number of calories absorbed, but also acts to reduce blood sugar levels. Many healthy bean-containing recipe options like chili, enchiladas, and hummus dips served with whole grain chips are easily available and a great substitution for a fatty fast food burger while at work. Dinner time is the time to be lean and green by filling up on large portions of green leafy and root vegetables. It’s okay to have meat, as long as it is low in fat like fish, or chicken and turkey without the skin. But remember to keep to the 90/10 rule and let the meat be a small side dish rather than the primary platter. Low-fat dairy and olive oil can also add some flavor to the green and keep you not only full, but satisfied as well from cravings. Being creative with stir fry, baked eggplant and vegetable pizza recipes can take the boredom out of too much green as your dieting lifestyle adjusts to the changes. Dr. Furman recommends supporting the 90 of the 90/10 Rule by BOMbing your fat with Berries, Onions and Mushrooms. Berries, onions and mushroom prevent the formation of new blood vessels (angiogenesis) that are used by fat cells to keep them nourished and alive. He says that you can actually starve fat cells to death with anti-angiogenic foods and that the more of this type of food you eat, the faster you will lose weight. Dying fat cells and cellular damage from eating processed foods results in an accumulation of fluid-retaining toxins that needs to be flushed out of your system. One way to accomplish this is with a tasty and healthy drink made from pomegranate juice mixed with strawberries and lemon juice that are not only a good source of Vitamin C, but also possess anti-angiogenic properties and can protect against oxidative stress. Dr. Fuhrman recommends a health drink consisting of 1 cup of ice, 4 ounces of pomegranate juice, 1 cup of strawberries and a little lemon juice for a refreshing toxin-flushing shake easily made in a blender. The added benefit is that this also reduces your cravings for something sweet like a soft drink. Replacing the ice with chilled soda water can turn this toxin-flushing drink into a nice, fizzy beverage. While Dr. Oz promotes this as a new 7-day, 10 pounds crash diet, it really comes down to being not-so-novel, common sense dieting advice with a new label placed on it. More grains and veggies, less meat and dairy, cut out all processed foods—we’ve heard it all before, but unfortunately rarely stick with it. Still, the 90/10 Rule is a good reminder and a rough dietary gauge that is useful and offers a promise that can become a reality. Even if you don’t lose that 10 pounds in one week—or even one month—you will still have won by making some healthy and beneficial nutritional changes to your lifestyle.